Moles are skin growths made up of cells that produce colour (pigment). A mole can appear anywhere on the skin, alone or in groups. Most people get a few moles during their first 20 years of life. They are usually brown in colour but can be blue, black, or flesh-coloured. Most moles are harmless and don’t cause pain or other symptoms unless you rub them or they bump against something. Skin tags are small, soft pieces of skin that stick out on a thin stem. They most often appear on the neck, armpits, upper trunk, and body folds. The cause of skin tags is not known. They are harmless. Why remove a mole or skin tag? Most moles and skin tags don’t require treatment. But sometimes people want to remove them for cosmetic reasons or because they cause discomfort when they rub against clothing or get caught in jewellery. Check with your doctor if you have a mole that looks differentfrom your other moles. He or she may need to do a biopsy of the mole, which means removing the mole and sending it to a lab to check it for cancer. Cutting it off. Skin tags may be snipped off with a scalpel or surgical scissors. Some moles can be “shaved” off flush with the skin. Other moles may have cells that go underneath the skin, so your doctor might make a deeper cut to remove the entire mole and prevent it from growing back. This cut may require stitches. Freezing it with liquid nitrogen. Your doctor will swab or spray a small amount of super-cold liquid nitrogen on the mole or skin tag. You might have a small blister where the mole or skin tag was, but it will heal on its own. Burning it off. An electric current passes through a wire that becomes hot and is used to burn off the upper layers of the skin. You may need more than one treatment to remove a mole. Skin tags are removed by burning through the narrow stem that attaches them to the skin. The heat helps prevent bleeding. The procedure may hurt a little, but your doctor will numb the area with an anesthetic before he or she begins. If the procedure causes any bleeding, your doctor may apply a medicine that helps stop the bleeding. Then he or she will put a bandage on it. 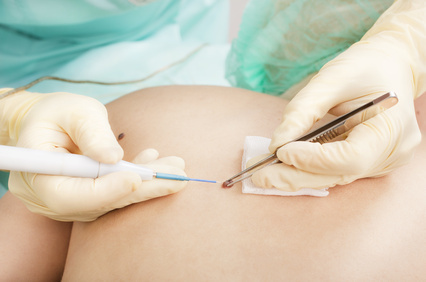 These procedures usually leave no scars or marks. Can you remove moles and skin tags at home? Home remedies, such as using nail clippers to cut off skin tags or lotions and pastes to remove moles, may cause bleeding, infection, and scarring. And it’s important that your doctor check moles before they are removed. It’s much safer to have your doctor remove your moles and skin tags for you.